Today I have an exciting announcement to share. 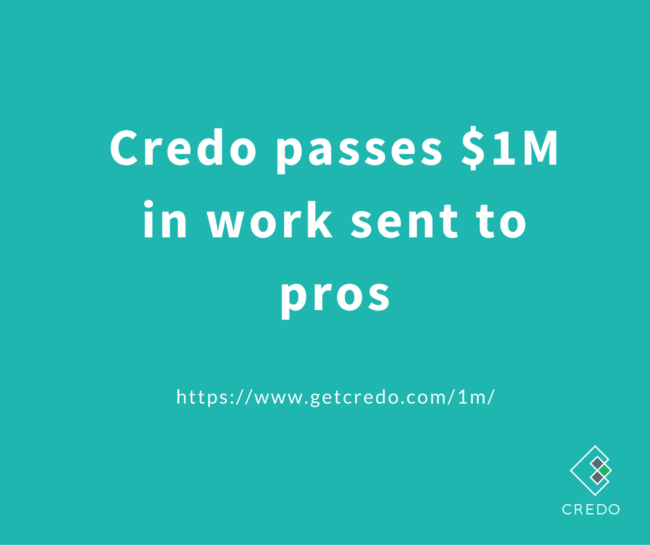 As of the end of October, Credo has officially passed the $1 million mark in work sent to pros on the platform! Every month, Credo continues to grow faster and faster. It is amazing to me that in 13 months time, I have hit this milestone as a solo bootstrapped entrepreneur. Credo is an amazing business to run. I get to work with fantastic business owners (agencies and consultants) who are doing great work for their clients. I get to help them get access to more businesses who need their services, and I even get to work with some of them to help them sell better work (more on that here). Leads increased 75% month on month thanks to a dedicated partnership. Organic traffic increased 21% month on month. Time on site increased by 37%. Pageviews increased almost 90% month on month. Ran 4 new conversion tests and pushed two live. Decreased bounce rate by 1.35%. As you may or may not have seen, I closed Credo Pro signups for a few months while I rework the new pro signups. So, all of these changes currently happening are only better and better for current pros. And when new pros are onboarded onto Credo in the future, my goal is to it in such a way that everyone continues to get more value than they pay for. In October alone, over $250k worth of work came through Credo. November and December are usually slower months in the lead generation business, so I expect that number to remain flat in November and December and then to grow once again starting in January. Thanks again to all of you who are putting your faith in and supporting Credo as it grows. “Leads increased 75% month on month thanks to a dedicated partnership. Hey Kieran! Leads overall increased by 75% month on month, both from the dedicated partnership as well as organically. Congrats on the success and keep the flywheel moving!